TruePublica Editor: One of the greatest social and political challenges of our time is raising its ugly head with increased frequency nowadays and is doing so with a renewed arrogance and confidence that I find breathtaking. There was a time when Britain seemed invulnerable to tyranny. Yet since the year 2000, it has systematically gone about eliminating core rights and protections that took centuries to secure. Civil liberties or personal freedoms are personal guarantees and freedoms that the government cannot abridge, either by law or by judicial interpretation, without due process. Now, the governments’ commitment to its own legality when it comes to our civil liberties are at best fading. Encouraged by a government who has been consistently cracking down on oppositional voices, Leeds City Council has decided in its infinite wisdom to cancel this years ‘Media on Trial’ event. This event challenges mainstream media legitimacy, in particular focusing on Britain’s foreign policy actions in the Middle East. Questioning propaganda and disinformation campaigns propagated through the media is fair game given events more recently with last months attack on Syria. The irony, lost on officials at Leeds City Council is that this attack on free speech comes on World Press Freedom Day. The event, scheduled for May 27 at Leeds City Museum, was to feature an expert panel including Professor Piers Robinson (University of Sheffield), Tim Hayward (University of Edinburgh), investigative journalist Vanessa Beeley, independent researcher Robert Stuart, and Peter Ford, former UK ambassador to Syria amongst others. This is not an easy event to organise and has been advertised for some time. It makes no difference where you stand personally on the political spectrum, you and others, have a right to question what all political parties are up to, including the institutions that are supposed to support civil society. The mainstream media has not been vaccinated against the same scrutiny. This action by Labour party representatives amounts to flagrant and shameless censorship and is a direct assault upon the continuing erosion of civil liberties in Britain that was advanced extensively by Tony Blair’s government from 2000, its progression has not been halted ever since. Without civil liberty, you get inequality, discrimination and injustice – something that both Labour and Conservative have been deeply implicated in with recent reports of racism and anti-semitism, confirming that neither are committed to the ideals that should bind us all as a nation. So there you have it. Questioning the government or mainstream media ensures the branding iron is nice and hot – you’re a propagandist or conspiracy theorist! If Mr Dickinson has a view strong enough to say such things he should go to the Media On Trial event and try to use intelligent persuasive debate or perhaps provide some evidence to reinforce his views – not stamp on the face of civil society by advocating censorship and banning the event. Perhaps, the local newspaper, the Yorkshire Post in this case, also should have asked the opinions of someone without such extreme opinions and political bias as this. Whether you harbour opinions like Toby Dickinson, the Yorkshire Post, the County Council or the Museum itself – the issue is that by crushing free speech, you actually give oxygen to the wrong elements of society and give the wrong messages to all citizens. No-one has to agree with the speaker’s views. None are banned from public speaking or members of extreme or proscribed groups to my knowledge. If they had been, they would have been arrested – and rightly so. The vast majority are British citizens, have passports and therefore have rights, rights that have been denied, not just to them, but an audience of people who have paid money to hear their views. Here is the organiser’s statement of cancellation. Again, you don’t have to agree with it – just acknowledge what they have said. 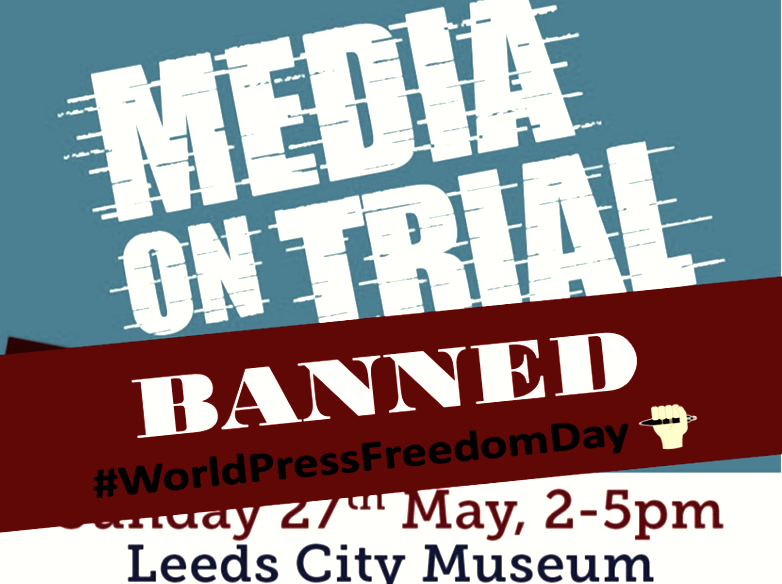 Today, on World Press Freedom Day, Leeds City Museum, a city council owned and operated venue, cancelled the Media on Trial’s booking for the event we had planned for 27 May. The fact that the event was cancelled is perhaps bad enough. What became clear as the day has progressed, though, is that Leeds City Museum appears to have informed the press and media of the cancellation before they informed Media on Trial organisers. Indeed they waited for the Media on Trial representative to arrive at the venue for a planned meeting following a four-hour train journey before giving us the news. They seem to have taken this decision on the basis of misinformed assumptions about the content of the event, and offered no right of reply to Media on Trial. Leeds City Museum has cancelled an event that threatened mainstream media and UK Government narratives that have enabled another regime change war to be waged against Syria, financed by British taxpayers contributions. The cancellation of the event denies public consensus a platform to express its profound dissatisfaction with the systematic disinformation campaign run by a British media that protects power from truth, rather than holding truth to power. Media on Trial fully intends to hold this event despite these attempts to silence us. We will be in contact with ticket holders shortly to explain our plans. Further information will be published at https://www.mediaontrial.uk in due course. If anyone in the Leeds area can suggest alternative venues, please let us know and we will pass the information along. In the meantime, please share this as widely as possible.